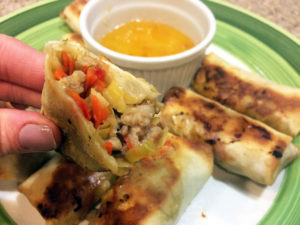 These egg rolls are such a huge hit every time I make them. Not only do they taste like the real thing, but they’re baked, so you don’t feel as guilty eating them. I adapted the recipe from the egg roll wrapper package. You can make the full batch with all pork or all shrimp or divide it in half and make some of both (as detailed in the recipe below). In a large skillet, stir-fry the ginger and garlic in 2 tablespoons of vegetable oil until fragrant, about 30 seconds. Add green onion, carrots, and red pepper, and cook for 2 minutes over high heat. In a bowl, combine the chicken broth, soy sauce, and sugar. Add that mixture and the Napa cabbage to the skillet, bring to a boil and simmer for 5 minutes, until veggies are soft. Add sesame oil, cool for at least 15 minutes, and strain. Divide into two separate bowls, and add cooked shrimp to one and cooked pork to the other. Lay out an egg roll wrapper with a corner pointed toward you. Place about a 1/4 cup of the mixture in the center of the wrapper. Fold the bottom corner up to cover the mixture, and then the left and right corners toward the center. Brush the top corner of the wrapper with water, and roll the egg roll toward the top corner to seal. Place on a greased baking sheet seam side down. Continue with the remaining wrappers and mix. Bake at 400 F for 10-12 minutes, flipping halfway through. Serve with sweet and sour or duck sauce. *To freeze: Place unbaked egg rolls on a wax paper-lined baking sheet. Transfer to freezer for at least 1 hour. Remove from freezer and place immediately in a large resealable bag to freeze. To serve, defrost on a baking sheet, and then bake according to recipe directions.